Selma Auto Service - Selma Auto Service is smog check station and auto repair in Selma, CA. 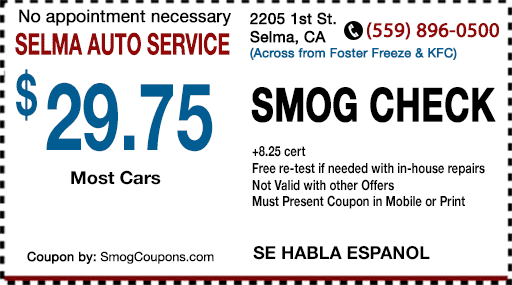 Selma Auto Service is smog check station and auto repair in Selma, CA. Selma Auto Service is smog check station and auto repair in Selma, CA. We can certify DMV smog checks, smog test, STAR Smog check; smog certification and smog check coupons. We provide Auto repair: Tune Up, Transmission, Timing Belt, Brake Inspection, Brake Repair, Oil Change and 30K service 60K 90K. Smog Check Station Vacaville CA Get your STAR certified Smog Check test done fast and affordable at Vacaville Smog check Station and lower your vehicle emissions.